When a holding company for a group of businesses or a closed-end mutual fund is trading at a discount to its holdings or to its book value, it is usually because there is a track record of poor capital allocation decisions at the company. But this is not always the case; sometimes discounts are just plain unwarranted, which could present compelling opportunities for value investors. Capital Southwest may be one example. It has been discussed on this site before, but while its price hasn't changed, its portfolio has continued to increase in price. 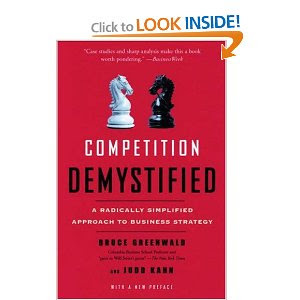 Morningstar's equity research director authored this book on identifying companies with competitive advantages. Dorsey separates competitive advantages into four categories, providing a framework for understanding how wide a moat a company really has. 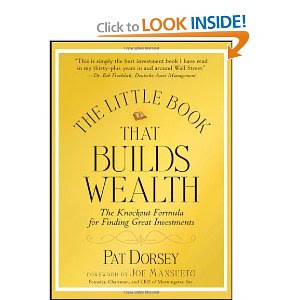 The book is full of examples of companies Dorsey believes have moats, and the reasons why their moats are likely to last - or not! Aztec: Just How Long Is Your...Term? As value investors, we know we are supposed to think long-term. But just how long is that term supposed to be? Some are probably looking for price appreciation just one year out, whereas others might be looking three years, five years or even ten years out. With a company called Aztec Land and Cattle, however, you might be looking at significant appreciation about 30 years out. Oddball Stocks has an intriguing post on this company that owns a ton of acres in Arizona but trades as if each acre of that land is worth only $49. The company has a development plan that may take years or even decades to bear fruit, but where the payoff is likely to be large. Are you prepared to wait? Shares of global telecom giant Telefonica (TEF) have been decimated lately as most Spanish stocks (even those cross-listed in the U.S. like Telefonica) have taken a beating due to the economic crisis in Spain. But while Spain does suffer from a recessionary environment and an unemployment rate of 23%, the market has likely overreacted when it comes to Telefonica: its shares are down 43% in the last year, even though only 30% of the company's profits come from Spain, whereas over half of the company's profits come from a healthily growing Latin American market. A fascinating article in the NY Times describes why we experience loss aversion, a tendency that appears to play a large role in how prices move in the market. Industries In Which To Invest? Many moons ago, World Wrestling Entertainment was discussed on this site for its seemingly unsustainable dividend. Since then, the dividend has been cut, and the shares trade for less than half of what they did then! But WWE actually has a pretty consistent core business that throws off cash flow from wrestling events (tickets and tv revenue) and the licensing of its brands for games, toys etc. At its current price, WWE trades at a single digit multiple to its average free cash flow, despite a huge cash balance. Is It Risky or Uncertain? Outside shareholders of Paulson Capital are somewhat in the dark right now. We know the company has an agreement in principle to sell its retail brokerage business, but as previously discussed we have no idea as to its price. Last week, however, we got our first clue of what at least one insider thinks of the company's share price. Last year at this time, Bassett Furniture (BSET) was discussed on this site as a potential value opportunity. Today, it sits considerably higher, as the stock has risen significantly over the last few weeks despite a declining overall market of late. Peripheral device maker Logitech International (LOGI) now trades below its March 2009 lows, as it has now breached price levels not seen since 2003. Though the company has generated net income in excess of $500 million over the last four years and has a net cash balance of $520 million, it trades for just $1.3 billion. While many US stocks have risen steadily over the past six months in line with the market, Gramercy Capital (GKK) is an example of one stock that has not. For those who have been raising cash as the market has become more risky (thanks to its higher prices), Gramercy may represent a potential value opportunity. I recently read There's Always Something To Do, which describes the investment approach of the late Peter Cundill. Cundill was a Ben Graham-like value investor (with a few modifications) who generated returns in his fund of 15+% per year for 33 years.